Special Offer! Save 25% and receive a complimentary copy of this book when you order 4 or more prints. One copy per order. 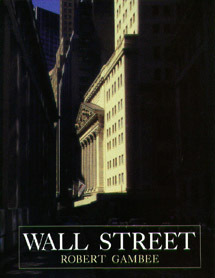 Wall Street is the most complete profile of the world’s preeminent financial center ever completed. Included are histories of every major bank, brokerage house, law firm and securities exchange. Everyone with an interest in finance and all who have worked in the field will enjoy this magnificent reference book. It contains over three hundred color plates with detailed captions an a comprehensive index. Make this a unique, personalized gift by printing your firm’s name on the book jacket. For pricing on quantity discounts & custom-printed jackets, see our Pricing Guide. Photo Details | About | Contact Copyright © 2011 Robert Gambee.